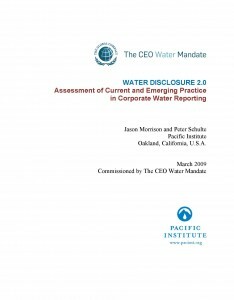 The CEO Water Mandate report, Water Disclosure 2.0 – Assessment of Current and Emerging Practice in Corporate Water Reporting, examines and analyzes corporate reporting on water sustainability for 110 companies across 11 water-intensive sectors. The assessment tracks the six key elements addressed by the CEO Water Mandate: Direct Operations, Supply Chain and Watershed Management, Collective Action, Public Policy, Community Engagement, and Transparency. Commissioned by the United Nations Global Compact’s CEO Water Mandate, the report by the Pacific Institute finds better and more expansive disclosure is critical for understanding the true risks and impacts associated with companies’ water needs.